1. Two things to keep in mind while making crust are to keep everything cold, and to avoid overworking the dough. 2. In a mixing bowl, combine two cups of flour and 1 tbs cinnamon (or other spices). If you are using butter from another producer that is unsalted, be sure to add a teaspoon or so of salt to your creation. 3. Remove butter from the refrigerator (it must be cold!) and cut half the package into small ¼ inch cubes. 4. Add butter to flour mixture and using a pastry cutter or fork, quickly work the butter into the dough until no large chunks remain. 5. 1 spoonful at a time, sprinkle in the ice water. Use just enough so that the dough begins to clump together and be formed into a ball, but no more. 6. Chill the dough - preferably for 2 hours and up to two days. 1. Place cubed apples in a bowl. 2. Mix with 2 tbsp of flour to create even coverage over all apples. 3. Add cinnamon and sugar. Mix to combine. 2. Prep your area - sprinkle flour on a clean counter space. Have about a ½ cup of flour on hand to help you deal with sticky dough. Bring out a baking sheet and place it nearby so you have a place for your final product. Grab a small glass of water, to help you close up the edges of the pies. 3. Take out your dough and roll it out on the floured surface. Apply more flour as necessary to counter and rolling pin to keep dough from sticking. Roll out until dough is under ⅛ inch thick. 4. Cut out 4-5 inch diameter circles from the dough. You can form a ball with the scraps, roll it out again and create more circles until you’ve used up all the dough. 5. Place a handful of apples on each circle. Cover with another circle of dough and crimp or seal edges with a fork. If you are having trouble getting the edges to stick, use a pastry brush or your fingers to wet them with cool water, then seal them. 6. Poke a couple of holes in the top of each pie to let steam out. 8. Place finished pies on the baking pan, and bake for 12-15 minutes, or until pies are golden brown. 1. Prepare all of your veggies, chopping or grating them into thin slices. Sprinkle with salt and pepper. 2. 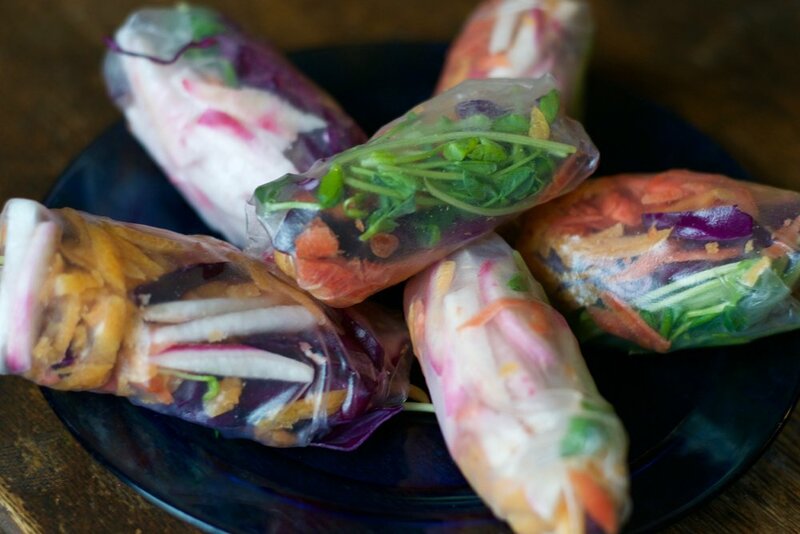 Follow the instructions on the packet of how to prepare rice paper rolls. 3. Layer the veggies in the roll and wrap up tight, tucking in the sides as you roll. 4. It may take a few tries to make it look good, but they will all taste good! 5. Serve with soy sauce, peanut sauce, or your favorite dipping sauce of choice. 3. Drop in potatoes and boil for 15-20 minutes, or until soft. Drain potatoes. 4. Place 4-5 potatoes on a greased baking dish and gently smash with a fork or potato masher. Sprinkle liberally with salt and pepper. 5. Top with shredded cheese and place back in the oven until cheese is melted, about 5 minutes. 6. Remove the baking sheet from the over. Add a dollop of pesto to each potato nest, then bake for an additionally 5 minutes. 1. Slice a section of your baguette in half lengthwise. Lightly toast in the oven or toaster. 2. Spread pesto over each half. 3. Fry an egg in a nonstick pan. Top with cheese before removing from pan. 4. 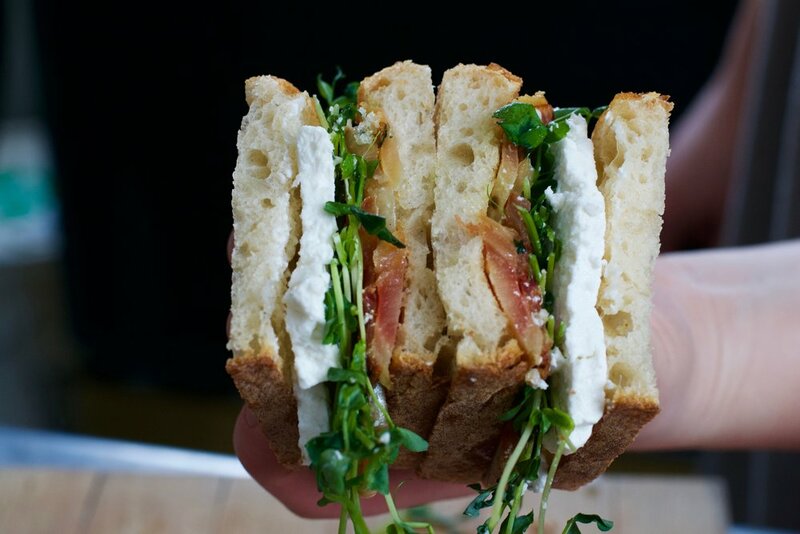 Place on bread, top with pea shoots, the other half of bread, and enjoy! 2. Place salmon and vegetables on one half of a large sheet of parchment paper. 3. Drizzle with olive oil, then sprinkle liberally with salt and pepper. 4. Place a few lemon slices on top. This will add great flavor and freshness to your dish. 5. Fold the parchment paper in half, covering your fish and veggies, folding the edges in on themselves from one corner to the next, creating a sort of sealed in packet. Here is a video on how to fold it with some other fun flavor combinations! 2. Add onion and cook until onion softens, 4 to 6 minutes. 3. Add apple cider and bring to a simmer with medium-low heat. 4. Stir in red cabbage and season with salt and pepper. 5. Add vinegar and water. Turn up the heat to bring to a boil. Then turn down the heat to medium-low to reduce to a simmer, cover, and cook until cabbage is tender, 20 to 25 minutes. First, thaw the sausages. 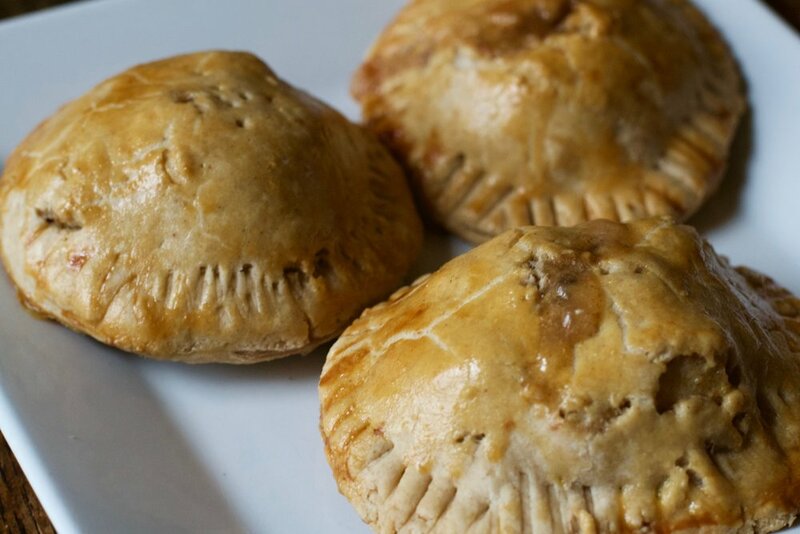 After they're thawed, you can poke a few holes into the casing with a fork - but not too many or you will let all the flavor & juices out as they cook! Add the sausages to the pan cook for 10-12 minutes, turning often, until they are browned all around. 2. Add chopped potatoes and cook until soft. 3. Remove from water and mash in a bowl. 4. Add egg, flour, and baking powder. 5. Add your sweet or savory ingredients to the batter, or split batter and make both options! 6. Heat butter or cooking oil in a non-pan. 7. Place a scoopful of batter onto the pan and smooth down to about a half inch thick. 8. Cook on each side until golden brown and crispy, about 4-5 minutes. 2. Place parsnips in boiling water, let cook until soft, about 10 minutes. 3. Place white beans, parsnips, olive oil, lemon juice, salt, pepper, and parsley into your food processor and blend until smooth. A food processor works best, but a blender should do just fine! 4. Taste and add more seasoning accordingly. 5. If there is trouble with blending, add more olive oil, lemon juice, or a splash of water. 1. Toss beets with oil, salt, and pepper, then roast at 400˚F for 20-25 minutes, flipping halfway through. 2. Before turning oven off, toast bread directly on rack for 1-2 minutes. 3. Place beets on one slice of bread, covered by a layer of pea shoots, and sliced feta. 4. Top with the other slice of bread and cut in half. Enjoy! 2. Place veggies on baking sheet with olive oil, salt, and pepper. 3. Roast until soft, about 25 minutes, flipping half way. 4. Place on a serving dish. Drizzle with balsamic. Crumble feta over top, and finally garnish with pea shoots. 2. Add flour and whisk until fully combined, let cook 2-3 minutes. 3. Add heavy cream and milk, bring to a boil, reduce heat and simmer 5 minutes. 4. Add shredded cheddar and stir until melted and combined. Your sauce should be thicker than milk, but not so thick it does not easily drip from a spoon. 5. Preheat oven to 400˚F. 6. Slice beets and potatoes and layer “standing” in a glass dish. 7. Pour cheese sauce over vegetables. 8. Bake dish in the oven, loosely covered with tinfoil, for 45 minutes. Remove tinfoil and continue cooking another 10-15 minutes. 9. 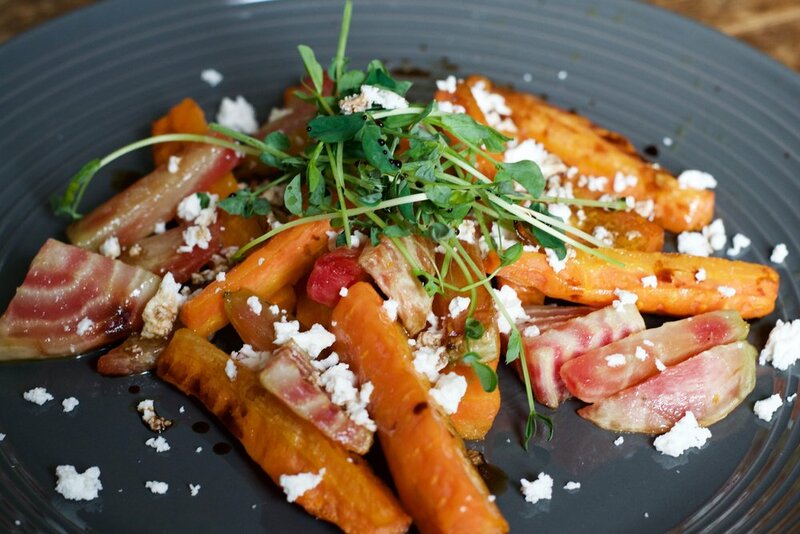 Your dish is done when vegetables are soft to touch with a fork. Enjoy! 1. Slice bread and toast in oven or toaster. 3. Crumble feta cheese over top. 1. Bring a medium pot of water to a boil. 2. Core and quarter apples. Peel skin before chopping if you prefer your apple sauce with no apple skin. 3. Place apple pieces in water and boil 10-15 minutes. 4. Drain and place into a clean bowl. 5. Add your sweetener of choice. We used sugar, but maple syrup or honey would be delicious as well. Now is also when you can add your preferred spices such a cinnamon. 6. Mash with a potato masher or fork. 2. In a pan, sear each side of the pork chop with a bit of oil or butter. 3. Remove from pan and place on a baking sheet. 4. Finish cooking in the oven for 10-15 minutes or until cooked through. This recipe combines your leftovers from the week in a new and tasty way! You may also want to add a soft boiled egg! 1. Prepare rice noodles according to package instructions. 2. Heat chicken broth over medium-low heat. 3. Pour chicken broth over finished and drained noodles in a small bowl. 4. Add in your veggies! Roasted Squash, sauteed cabbage, and mushrooms. 5. 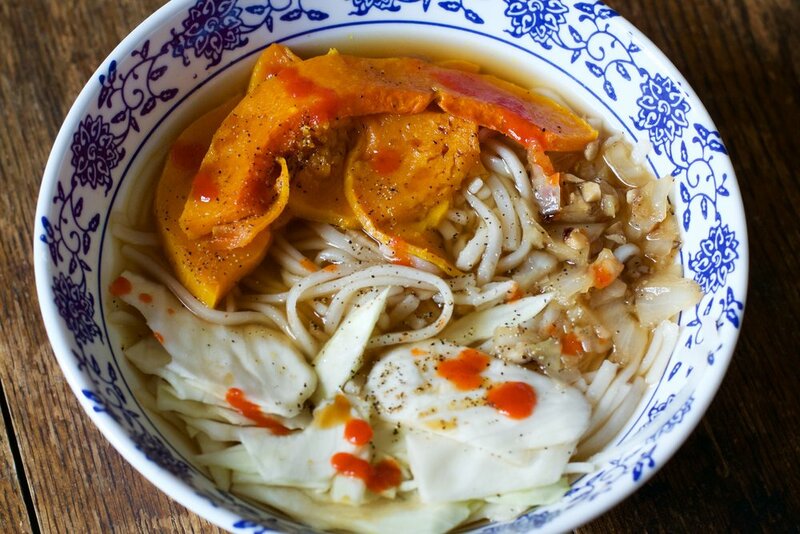 You might also fry some extra wontons wrappers and add them to the edge of your noodle bowl. 1. Add honey, red wine vinegar, and chili flakes in a small bowl. 2. Place a wire rack on a baking sheet and place your drumsticks on the rack. 3. Brush wings with olive oil, salt, and pepper. 4. Bake until cooked through, about 35 minutes. Flipping half way. 5. When there is about 10 minutes of cooking time left, brush chicken with the honey chili sauce. 6. Chicken is finished when the internal temperature reached 165˚F. 1. To cool things down, combine Butterworks Farm yogurt with your favorite fresh herbs. 2. Dill would be a create combination with the chili flavors! 2. Chop squash and sweet potato into half-moon shapes and place on a baking sheet with olive oil, salt, and pepper. 3. Bake for 20-25 minutes, flipping halfway. 4. Remove from oven and brush with some of the chili sauce. 1. To cool things down, combine Butterworks Farm yogurt with garlic, lemon honey, salt, pepper, and/or fresh or dried herbs (to taste). Parsley or dill would be a create combination with the chili flavors! Salt, Pepper, and additional spices if preferred. 1. Place grated sweet potato and squash into a large bowl. 2. Add salt and pepper. Now is the time to also add your other favorite spices – garlic powder, paprika, and chili flakes would all be great! 3. Pat your potato and squash mix with a paper towel to remove some of the moisture. 4. Heat olive oil or nonstick spray in a pan. 5. Place about ½ cup of your mixture into the pan and let cook. Flip when the first side begins to brown. 6. Create a small dent in your potato nest and crack an egg into it. 7. Cover with a lid to fully cook egg. Once your egg is cooked through you are ready to serve! Beets are the secret ingredient to these gooey, extra chocolatey brownies! The swirls of caramel don't hurt either! Consider using the Ploughgate Creamery Butter from last week’s basket and the eggs from your share if you receive them! 1. Preheat oven to 325F. Grease or line a 8x8x2 metal pan with parchment foil paper. 2. Using a saucepan over medium heat, melt butter. Stir frequently as it continues to bubble. When there are small brown specs, and it smells like nutty caramel, remove pan from heat. 3. Add sugar, cocoa powder and salt to combine. 4. In separate bowl, beat eggs. After butter mixture has cooled in pot 4-5 minutes, slowly pour in eggs, stirring constantly until well combined. 5. Add vanilla and beet puree, stir to combine. 6. Add flour and baking powder, stir to combine. 7. Add chocolate chunks, stir to combine. 8. Drizzle caramel sauce over brownies and swirl around with a toothpick. 9. Bake 25-35 minutes in preheated oven or until top no longer looks wet. Enjoy! Not much of a "from scratch baker"? You can also mix the beet puree in with your favorite kind of boxed brownie mix. Follow the regular instructions, but be sure to add 1/4 to 1/2 cup flour to bulk up the mix for the beets! 1. In large pot, heat olive oil over medium-high heat. Add carrots, parsnips, and chopped onion; cook 6 to 8 minutes, until vegetables are tender and beginning to brown, stirring occasionally. Optional: if you're planning to add ground beef, you can cook this while your vegetables cook. In a separate pan, cook over medium heat until browned with salt and pepper. 2. Add chili seasoning to vegetables in pot; cook 1 minute, stirring. 3. Add tomatoes with juice, whole and mashed beans, and 2 cups water; heat to boiling on high, breaking up tomatoes with side of spoon. If you're adding in ground beef, you can do that here. Drain some of the grease from your pan and add the beef to your pot of chili. 4. Reduce heat to medium and cook, uncovered 10 minutes, stirring occasionally. 5. Serve over mashed potatoes, quinoa, or couscous. Adding Shelburne Farm Cheddar and serve with a thick slice of bread! 1. Fill a large pot of cold water, and add chopped potatoes. 3. Once potatoes are soft, drain and begin to mash. Add butter and cream, continue to stir using a fork or potatoes masher. For extra fluffy and smooth potatoes, consider combining with a hand mixer. 4. Serve as a side or under your Parsnip and Carrot Chili!